Premium Aquatics: Visi-Therm 25 watt Heater regular price $17.99, now only $10.99! Salty Critter: Tunze Master DOC 9460 Skimmer, regular price $1824.51, now only $1139.00! Marine Depot: 20% OFF JBJ Automatic Top Off (A.T.O.) System Water Level Controller. Regular price $99.99 now only $87.99. That Pet Place: Koralia 4 Controllable Wave Pump – 550 to 1400 gph, regular price $59.89, now only $51.89! 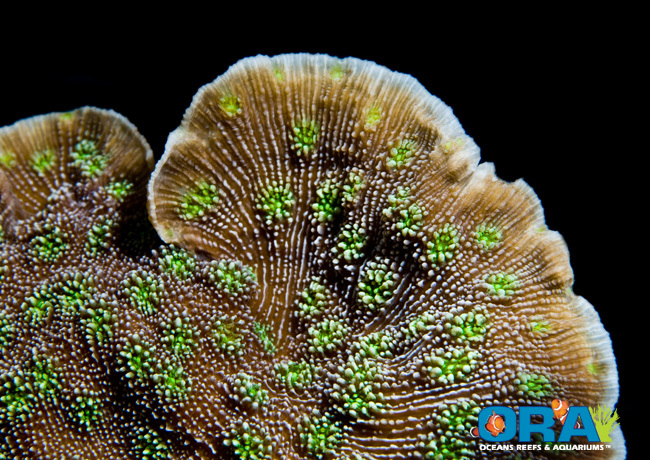 Bulk Reef Supply: 10% off Two Part Calcium and Alkalinity Solution! 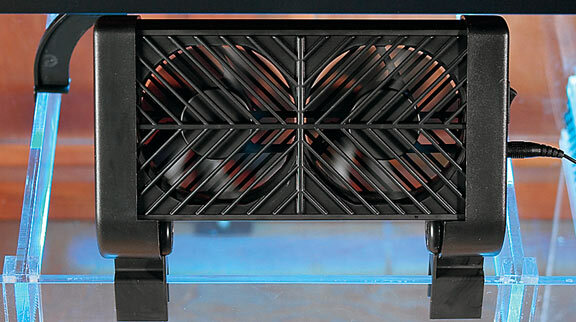 Foster and Smith Aquatics: 20% off Azoo Cooling Fans. Reef Specialty: Coralvue “High Seas” Wave Makers – CV-102B. Regular $32.99, now only $29.65! SeaQuest Marine: D-D RowaPhos 1000ml. regular price $79.95, now only $70.88! Aquarium Guys: Supreme Mag Drive Water Pump 700GPH. Regular price $91.79, now only $70.79! Here’s a hot Aussie Scoly that is coming to LiveAquaria’s Diver’s Den tonight. 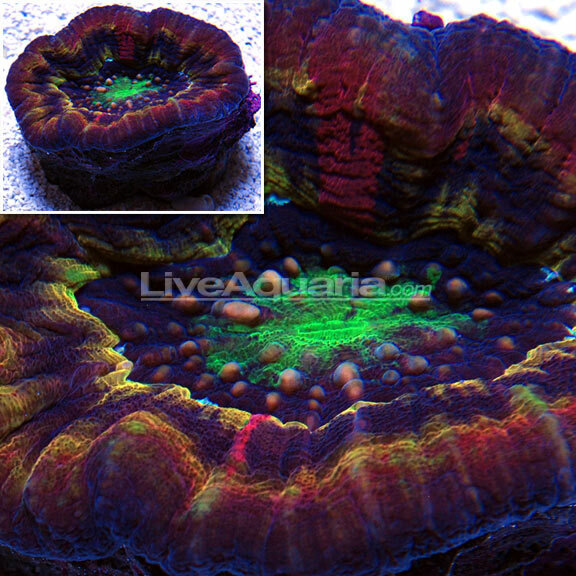 This particular scoly has a brilliant green center, with yellow, purple, orange and red on the outer rim, and several bright pink stripes. We can’t wait to see who the proud owner is. If you’re interested, remember to check out Diver’s Den tonight. Giant clams start out like all other clams, as a small larvae floating in the ocean. They begin growing by using the food they obtain from filtering. But at some point, they pick up small algae called zooxanthellae that and a symbiotic relationship which allows the clam to be solar powered. 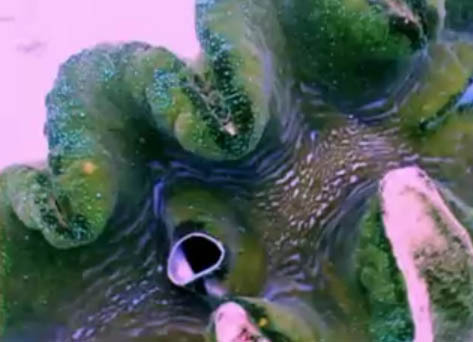 As it continues to filter feed, the giant clam now has two fuel sources. This extra fuel source can grow to an absolutely massive size. Some giant clams can actually grow to more than 4 feet across, and weigh upwards of 500 lbs. Now, lately, the numbers of giant clams has been declining. One solution to this problem, is setting up giant clam farms, which in turn may help wild clam populations to rebound. Seachem, who just brought us Reef Phytoplankton and Reef Zooplankton, is now hiring! The company has been constantly growing, and is now looking for some new employees to facilitate and support it’s increasing market. Seachem is currently looking to fill a Sales Manager position for the Midwest/Central US region. We are looking for self motivated people with a solid drive to move business forward. Applicants should be able to travel with some frequency. Relocation may or may not apply based on current residence. Preferred attributes include: business degree, experience in the hobby/industry, experience in sales, good understanding of science/technical matters, fluency in multiple languages, ability to build and maintain productive business relationships. The International Detailing Representative is expected to coordinate dealer sales programs through aggressive detailing of the international sales territory. This includes all areas outside of The United States. This position is full-time and includes benefits such as health/dental insurance and paid holidays. We are seeking an enthusiastic individual whose goal is to work toward growing with our company. The Sales Support and Education Specialist position will require an individual to speak with customers to answer technical questions about a variety of different topics including, but not limited to: water chemistry, fish/reptile biology, and general aquarium/pond maintenance. In addition, this person will be responsible for providing customer service to the retailers of our products and participating in training sessions in order to educate retailers and end users. There are opportunities to travel while working in this position as well. The full-time employee will receive benefits such as heath/dental insurance, paid holidays, leave time, etc. This position requires, at minimum, a bachelor’s degree in a science-related field. Applicants should be willing to travel and possess excellent verbal and written communication skills. The ability to present effectively in front of large groups is also required. This is a great opportunity for anyone looking to put their science degree to use in a very unique field. 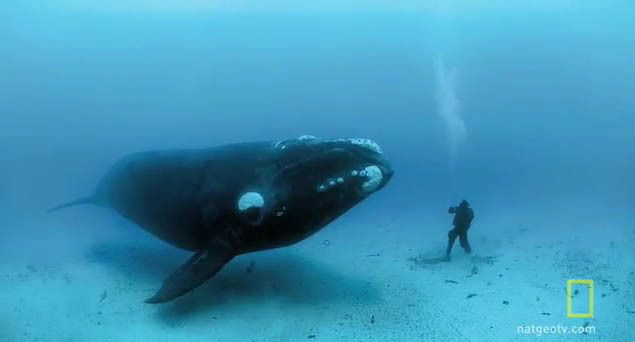 During a 3-week winter expedition to Auckland Islands, National Geographic photographer Brian Skerry and his assistant encountered an incredible 45-foot long Right Whale. The whale swap down to the bottom and gently approached the duo. Brian’s assistant, stood on the ocean-floor and posed perfectly for this amazing shot. “Our hearts were beating right out of our chest, because it was so exhilarating,” says Skerry, “but there is no threat by this animal it just had a great deal of curiosity”. The result, this amazingly composed shot. “I’ve had some magnificent animal encounters out there in the wild; but I have to say, this one tops the list.”Can you imagine being at the bottom of the ocean and seeing this giant swimming towards you. How incredible. Right Whales, which refers to three species of large baleen whales, were given this name by whales who considered them “right” for the hunt, due to their tendency to swim close to the shores, and then float when killed. Because of these two factors, they almost became extinct by the whaling industry. 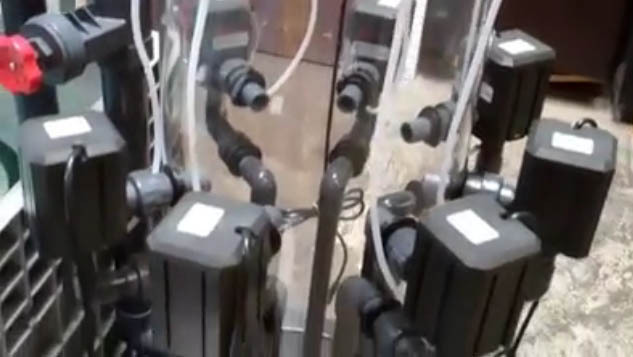 Here is a cool video from Reef Dynamics, displaying their new XRC2000 Protein skimmer. The reaction chamber of this huge protein skimmer is 16″ in diameter, leading to a 6.5″ neck, and a 12″ diameter cup that is also 12″ tall. Now that you’re confused with all these number, let’s move on. The cup uses a bayonet-style ring, for easy removal and service. The Skimmer cup comes pre-drilled with 1″ drain fitting that you can attach a valve to. Let’s talk about power. The XRC2000 has 7 Eheim 1262 pumps recirculating water. Each of the pump is connected with dual schedule 80 unions, which makes for easy maintenance. The inlet fitting on each pump goes to the bottom of the skimmer, which pulls low-oxygen water, and increases the efficiency of the venturi. All XRC skimmers have a gate valve on their outlet, to control bubble height. The skimmer has a drain valve by the base plate, which is used for emptying the reaction chamber. This is a must for either moving the skimmer, or performing maintenance on the pumps. Last year, we wrote about a cool motorized protein skimmer neck cleaner called the Swabbie. This cool little reef gizmo, helps keep your skimmer neck clean from build-up. A clean skimmer neck means that nothing is there to impede foam from rising into the cup. Basically, all you need to do, is plug the Swabbie into a timer, and have it turn on 4-6 times a day, that’s it. Basically, set it and forget it. 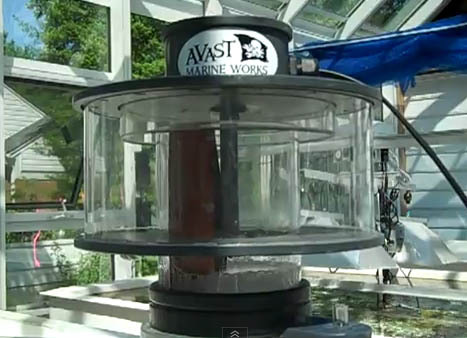 Avast will even retrofit a swabbie unto your existing skimmer lid. The Evolution UFO LED light has a circular design, with a big face to “emit a more effective light.” The Evolution UFO is available in both a 2:1 and 1:1 ratio of blue-to-white LEDs. The UFO is 3″ tall and 11″ in diameter, weights 8 lbs and comes with the needed hanging hardware. 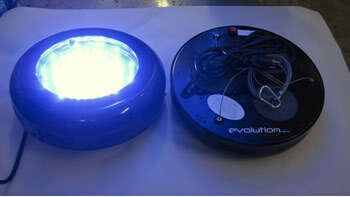 The blue LEDs used in the UFO are 460nm, and the white LEDs are warm white. The UFO projects light with a 90 degree optics. The UFO is said to be a good replacement for a 150W Metal Halide or an 18″ cube. 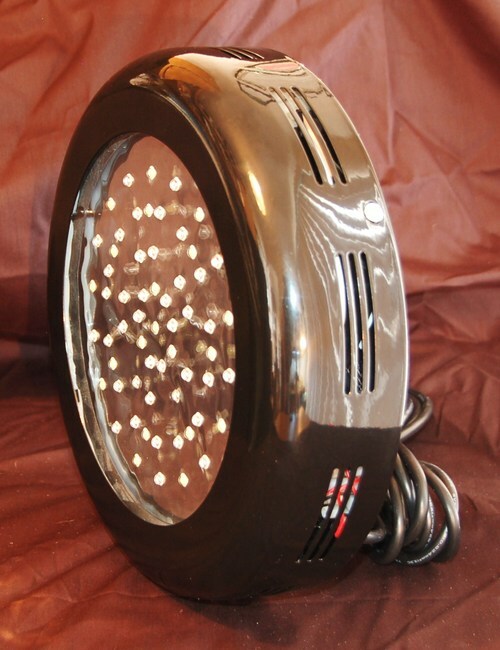 This cool LED fixture sells for $199.99 is has an expected 50,000 hours lifespan.